Hiking can be a mindful and meditative practice. It’s a beautiful way to get outside, move your body, and connect with nature on a deeper level. Yoga is no doubt a mindful and meditative practice as well, but we don’t always have the luxury of taking our mats onto a mountainside or into a meadow. Consider these ways to integrate your yoga practice—your mind, body, and spirit—into the methodical, mindful, and meditative movement of hiking. Start slowly with your steps and then begin to pick up your pace to a comfortable cadence. The repetition of movement that hiking creates is a nice way to help clear the cobwebs in the mind and body. If your stride starts to get tiring, decide if you are looking to maintain the rigor, or if you need your pace to be more rejuvenating. Even when an uphill hike can become challenging, keep close attention to your breath. Allow deep inhales and exhales to fill your body with the vitality it needs to move and explore. If you need to stop to catch your breath, it’s a perfect time to stand and cultivate gratitude for where you have been, where you are, and where are going. Hiking is a great time to take your mind off of the distractions of the modern world and tap into what the essence of nature’s gifts. Notice what lies before you, even if it’s a distant horizon, because the sky is the limit when it comes to the possibilities ahead of you and all around you. The beauty on hikes can be seen, and it can also be heard. As you walk, start to appreciate the subtle sounds around you—the chirping birds and the rustling leaves, the rushing water, and even the sound of your own footsteps. Take some extra time to learn all about the foliage that surrounds you. Knowing the names of flowers, plants, and trees can help to create a deeper understanding of all the amazing life that surrounds you in any given moment. Go ahead, hug a tree! Kim Fuller grew up in the Colorado mountains and has always found beauty and inspiration through nature and movement. 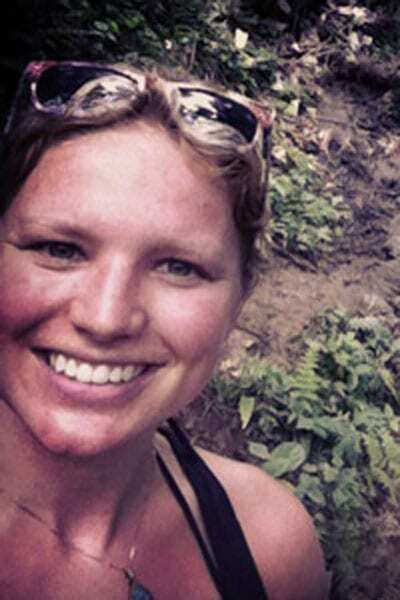 She is currently a freelance journalist and yoga teacher based in Vail. Her writing and photo work has focused on health, wellness, recreation, food, and travel since 2007, and Kim began her yoga practice in Boulder, followed by her first teacher training with Real Evolution Yoga at Peace Retreat Costa Rica in November of 2012.